A little over-dramatic maybe, but Reuters have put a video on their site titled ‘Euros Invade New York’, describing how some stores in Manhattan’s East Village are now happily accepting Euros from customers. With the weak dollar enticing European tourists to spend it’s interesting to see some stores adapting to cater to these consumers. As Robert Chu, owner of East Village Wines explains “We had decided that money is money and we’ll take it and just do the exchange whenever we can with our bank”. The lovely people at Good magazine have created their own version of the pop-up phenomenon with Good December; a community center and gallery store that has just arrived on Mulberry St, NY for the run-up to Christmas. Sponsored by Microsoft’s impressive i’m Initiative, the center is organized around the themes of Media, Environment, Technology, Design, Education, Culture, Business & Money, and Health, and alongside the book exchange, clothing drop-off, free wifi cafe and games such as shuffleboard, visitors can take part in organised events including Etsy’s DIY workshop or visit the health clinic check-in. Good December opened yesterday and will stay open every day until 23rd, so pop in and spread some festive cheer among your community. The Timberland Company have launched a community-building initiative called the Boroughs Project, where they hope to inspire people to express their neighbourhood through design. To kick off the scheme five artists representing the five boroughs of New York City have been hired to each produce a Timberland boot that reflects their passion for their community. Keeping it close to home, the limited edition boots will only be available at selected New York retailers where they retail for roughly $150. The Queens, Manhattan and Bronx designs were launched last week, whilst the Staten Island and Brooklyn styles will launch on February 26. The next step for the project is to take it further afield, extending to other cities and communities throughout the year, and building their online design contest where consumers can express their community pride through any form of uploadable creativity, and rank the work of others. Interestingly this does not seem to be another company simply getting the consumer to do the designing for them within a competition framework (although they do plan to produce a limited run of boots from the winning entry which will be auctioned off to benefit a qualified non- profit organization of the winner’s choice), instead Timberland are cleverly involving community and creativity to help strengthen both the perception of the brand and their own understanding of the customer. And from the website it looks like a lot of people have already been keen to submit their creative interpretations and opinions. 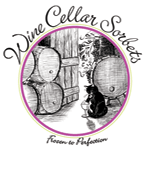 Cleverly combining food and wine for wine lovers throughout the country, Wine Cellar Sorbets produces refreshing sorbets made from vintage wines. Choose your preferred vintage from a constantly changing wine list that includes a selection of Californian and New York red, white and rosé wines. Available in New York and New Jersey gourmet stores, fine restaurants and caterers, it’s a ‘cool’ new way to enjoy your favourite tipple, and such a brilliantly simple idea I’m amazed it’s only just reached the market.